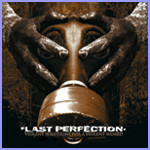 Last Perfection is a Queens-based noisecore band whose technical prowess and explosive spurts of aggression make an interesting five-track release. Sounding like Swedish metal meets Glassjaw, this quintet shines the most on tunes like the guitar-run heavy "Blue Sky Black" or the headbangingly rhythmic "Collapse Into a Lifetime of Easy Answers". By taking the most extreme metal parts and adding spoken word interludes over dissonant, churning dual guitars, Last Perfection guarantees both a horned hand salute and street credibility.